As Energy Assessor/Advisor I have to take a certain number of CPD courses per year to keep the business up to date and informed about latest regulations, policies, services and products. I am a member of MEP, the association of Midlands Energy Professionals, which aims to support its members with networking and training opportunities. Last Thursday MEP put on a Conference for all interested energy assessors called: ‘Assessors, you are not alone’. It was a fantastic event with a great turn out of 65 people of which plenty were new to MEP. It provided two big workshops about the present state of domestic and non-domestic assessment areas, followed by four more specialised ones. 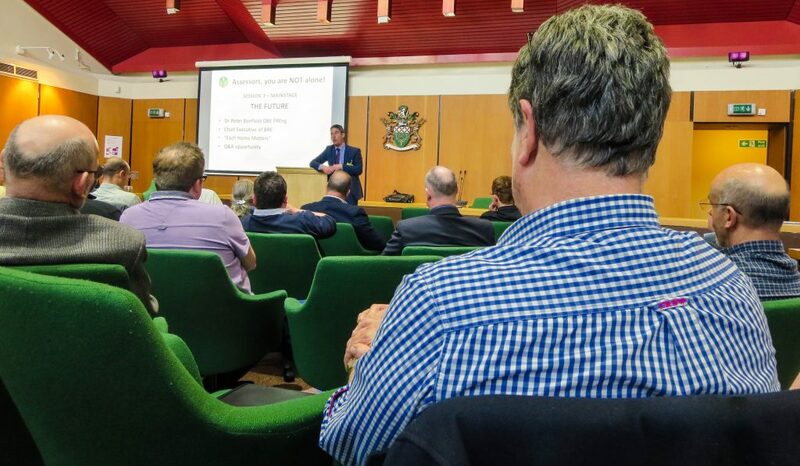 The final talk was held by Peter Bonfield (above), who was tasked by the previous Government to produce the report entitled ‘Each Home Counts’ https://www.gov.uk/government/uploads/system/uploads/attachment_data/file/57874/Each_Home_Counts__December_2016_.pdf This was in response to the closure of the Green Deal scheme in July 2015 to investigate its failures and to suggest improvements. His main point is the introduction of a Trustmark scheme, which doesn’t replace any existing schemes like the Gas Safe register, but links up the existing ones and covers new trades and sectors too.